Bertha Purnell served hot dogs at a pop-up barbeque held April 27 in Austin. Volunteers of Austin’s “good neighbor campaign” did not let the cold, rainy weather Friday, April 27 put a damper on their effort to stop gun violence in their community. The campaign hosted the second of several planned pop-up barbeques that will be held this summer in partnership with the Westside Health Authority and the Institute for Nonviolence Chicago. Community members and volunteers stood on the corner of Laramie Avenue and Ohio Street serving free food and beverages to neighbors to promote friendly conversation. Among the volunteers was gun violence victim advocate Bertha Purnell. Purnell, 58, lost her son to gun violence last year. She serves as chair of Cook County Commissioner Richard Boykin’s task force against violence and works on the outreach team for the Institute of Nonviolence Chicago. “I believe in being the change you want to see. 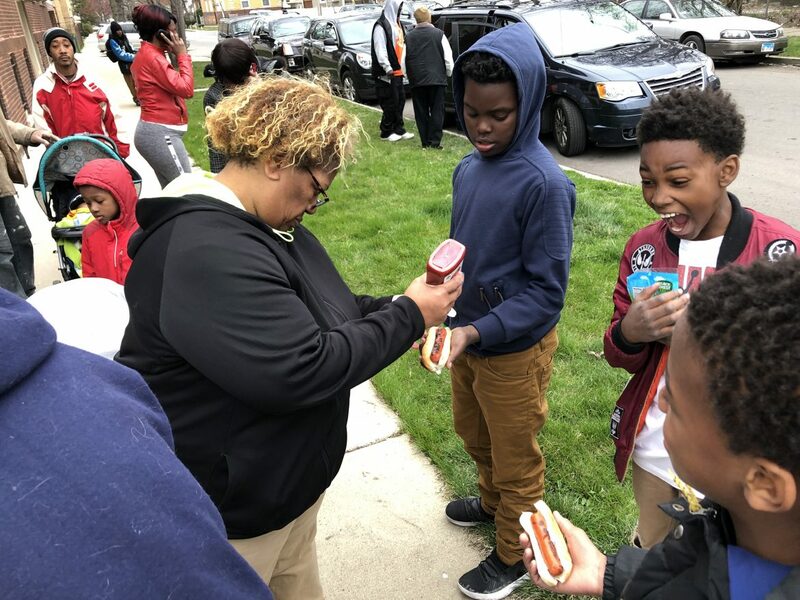 This barbeque is for everyone to connect and just be friendly towards one another and enjoy a meal together,” Purnell said as she cooked hamburgers and hotdogs for the crowd that gathered Friday evening. Smith works at the Institute for Nonviolence Chicago as a case manager assisting young men who were victims of or participated in gun violence. She seeks out employment opportunities, helps put together resumes, and assists the men in creating new lives for themselves that don’t involve violence. “Our community is what you make it. We need our neighbors to come out and talk to one another. That’s the first step,” Smith said. Members of Westside Health Authority also participated and provided food at the event. Pastor Dorin McIntyre (“Pastor Mac”) of Mount Olivet Missionary Baptist Church at 5642 W. North Ave. volunteers with both the good neighbor campaign and Westside Health Authority. He has been involved in what he refers to as the “street ministry” for about 20 years. “This is to get people to understand how they can give back to their communities,” McIntyre said. Also in attendance was 49-year-old Oak Park resident Jay Miller. Miller began volunteering with the good neighbor campaign in January because he wanted to get involved in Austin. “We are all one community here. I don’t like the hard line at Austin Avenue,” Miller said. The pop-up barbeques will continue throughout the summer every other week at various locations. Odessey Stewart, 16, and Devon Temple, 19, addressed incumbent Congressman Danny Davis and challenger Anthony Clark at a forum Saturday, just three days before the March 20 primary. The Institute for Nonviolence Chicago invites West Side residents to take part in a day of service on Jan. 21 from 10 a.m. to 1 p.m. There will be a discussion about the history of nonviolent action as well as the current work being done to build peace, then participants will make toiletry kits. Check-in begins at 9:30 a.m. at Friendship Baptist Church, 5200 W. Jackson Blvd. Receive $100 for every gun turned in from 10 a.m. to 2 p.m. Jan. 26 at Friendship Baptist Church, 5200 W. Jackson Blvd.